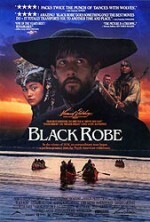 Based on his accalimed novel, Brian Moore wrote the screenplay for Black Robe, a story set in the hostile wilderness of New France in the 1630s. The film tells the story of Father Laforgue, who is the “black robe” of the title. Similar to the 1986 movie The Mission, in this film Laforgue`s mission is initiated by Champlain who sends a small group from the colonial outpost of what will one day become Quebec City to the distant settlement of Huronia, on the shores of Georgian Bay. Accompanied by a young carpenter, Daniel (Aden Young), who speaks the language and is always looking for the next adventure, and by Algonquin guides, Chomina (August Schellenberg) and his wife (Tantoo Cardinal), the journey for Father Laforgue turns from physical to spiritual as events conspire to test his faith in his religion and in himself as a man of the cloth, the robe, and himself as a man. 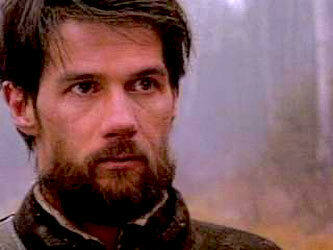 The journey ends in a deeper understanding of and a new-found respect for the people he set out to convert. Shot in the ruggedly beautiful Saquenay Lac St. Jean region of Québec, Black Robe was filmed in sequence and at almost the exact same time of year in which the original story was set. It won Genie Awards for best picture, director (Australian Bruce Beresford), adapted screenplay, supporting actor (Schellenberg), cinematography, and art direction. It also won the Australian Film Institute Award for cinematography and the Golden Reel Award in 1992 for the highest-grossing Canadian film of 1991.